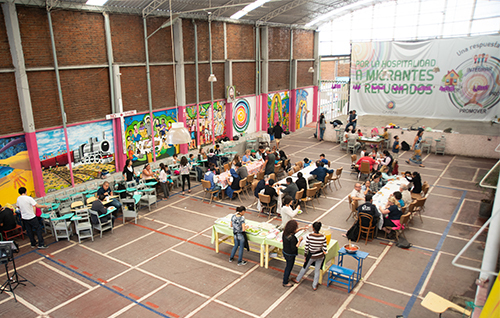 Their destination was Santa Rosa, an abandoned hacienda in Léon, Mexico, where the refugees were resettled as part of the first project for Catholic Relief Services. For the next 4 years, Santa Rosa became a haven from the violence they had fled. There, with the help of a group of Felician Sisters from Chicago, Julek and the others recovered their health and rebuilt their lives. 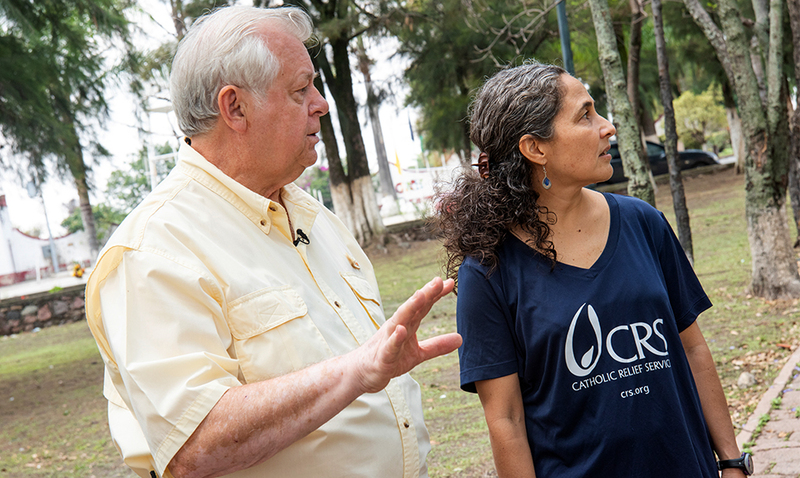 Julek Plowy and Cecilia Suarez, head of office for Catholic Relief Services in Mexico, tour the grounds of what was once Colonia Santa Rosa, where Julek and 1,500 Polish refugees were settled by CRS during World War II. Seventy-five years later, the refugees in Mexico have new faces. Unprecedented levels of gang violence in countries like Honduras, Guatemala and El Salvador have forced hundreds of thousands of Central Americans to flee. While many seek refuge in the United States, most end up applying for asylum in Mexico, unable to return home for fear of violence. To help, Catholic Relief Services is supporting more than 100,000 migrants through a network of about 60 shelters across Mexico. Through these shelters, run by the Catholic Church, migrants can access showers, food, accommodation and legal support. Many families are broken, having lost loved ones to violence. All face hardship and uncertainty. For Bishop Alfonso Miranda, Bishop of Monterrey and the General Secretary for the Mexican Bishops Conference, the migrant crisis in Mexico requires a new perspective. A student of the history of Santa Rosa, when Mexico opened its doors to Polish refugees, Bishop Miranda says the violence that has driven today’s migrants from their homes is no different than that faced by Julek Plowy and his family. What has changed, he says, is the global perception towards refugees themselves. The soccer field of the Don Bosco "City of Children" center in Leon, Mexico, as it appeared in the mid-1940's. The field was then a vegetable garden, cared for by the Polish refugees resettled here by War Relief Services, later named Catholic Relief Services. As migrants continue to flee Central America, Catholic Relief Services is reaching out especially to youth in those countries to address gang violence and build vocational opportunities. In Mexico, Catholic Relief Services is helping educate temporary farm workers, many of them migrants, about their rights — providing legal representation and supporting workers’ movements to improve wages and working conditions. For Cecilia Suarez, who sees firsthand the plight of the migrants through her work each day, their goals are no different than those faced by Julek Plowy, or any other refugee.